BE ACCOMPANIED BY RATHER HUMID CONDITIONS AND ONLY LIGHT BREEZES. INTERIOR SOUTH OF SEATTLE MAY REACH 100 DEGREES WEDNESDAY AFTERNOON. RELIEF FROM THE HEAT AT NIGHT. 3 DAYS...AVERAGE NUMBER OF DAYS IN A YEAR WITH HIGHS OF AT LEAST 90. LEAST 90 DEGREES ( AUGUST 7TH THROUGH AUGUST 11TH...1981 ). 90 (SET JULY 1958 ). YEARS ). LAST OCCURRED IN 2005. It has been nearly thirteen weeks since the last report of severe weather in the NWS Green Bay service area (22 counties of northeast and central Wisconsin). On April 24, scattered storms produced large hail and damaging winds in north-central and far northeast Wisconsin. Based on 30 years of severe weather reports (observations of 1 inch or larger hail, damaging wind gusts near 60 mph or greater, or tornadoes), this is the longest period during the northeast Wisconsin severe weather season (late spring through early fall) without severe weather. June and July are usually the most active severe weather months in this part of Wisconsin. In fact, there has never been a July without at least one report of severe weather in northeast and central Wisconsin. 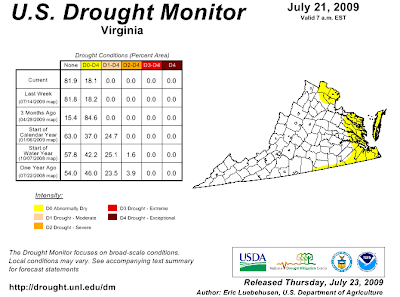 See here for previous drought reports. Yesterday's amount at Dulles was just a few hundredths less than the record for the date. Midnight Update: An additional amount of 0.56" at Washington National puts the month-to-date total at 0.82". This ties the record July low in 1872 with a week still to go in the month. Dulles picked up an additional 0.67", and BWI had 0.20". 6 PM Update: Updated daily totals, added month-to-date data. 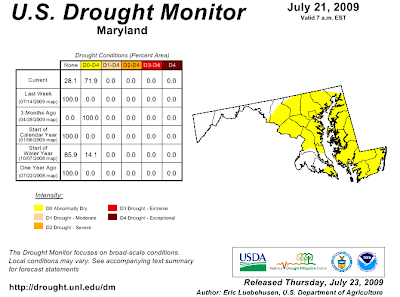 Scattered thundershowers are helping the situation in some parts of the region this afternoon, but a very dry July has put the majority of Maryland and portions of northern and eastern Virginia in the minimal drought category of D0 (Abnormally Dry). The weekly drought monitor, based on data through July 21, shows 72% of Maryland, 81% of Delaware, and 18% of Virginia are rated D0. Washington, DC, Baltimore, and their immediate suburbs are all included in that category. JULY. THE ONLY OTHER TIME THIS OCCURRED WAS 1996. 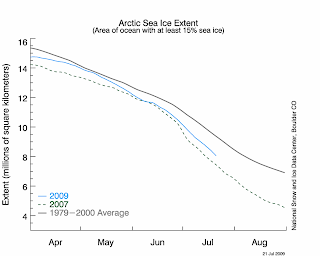 On July 21, Arctic sea ice extent was 8.28 million square kilometers (3.20 million square miles). This is 617,000 square kilometers (238,000 square miles) more ice than for the same day in 2007 and 1.36 million square kilometers (523,000 square miles) below the 1979 to 2000 average. 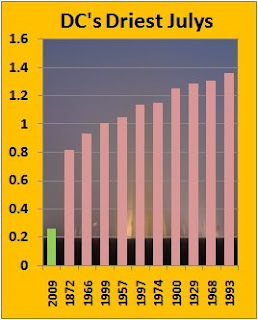 Ice extent on July 21, 2009 remained 8.06% higher than the same day in 2007, yet was 2.44% below the same day in 2008 and 14.06% below the 1979-2000 average for that day. The range of individual outlook values this month is from 4.0 to 5.2 million square kilometers, with most of the estimates in a narrow range of 4.4 to 5.2 million square kilometers. The two lowest estimates, 4.0 and 4.2 million square kilometers, would represent a new record minimum. 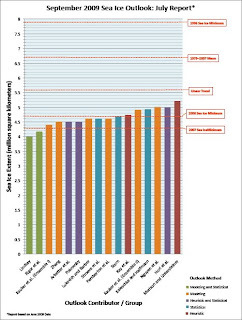 All estimates are well below the 1979–2007 September climatological mean value of 6.7 million square kilometers. The uncertainty / error values, from those groups that provided them, are about 0.4 million square kilometers, thus many of the values essentially overlap. CURRENTLY THE TOTAL RAINFALL FOR THE MONTH OF JULY IS 0.06 INCHES. NORMAL RAINFALL FOR THE MONTH IS 0.79 INCHES. SEATTLE IS 0.03 INCHES SET IN 1922 AT THE FEDERAL BUILDING. A RECORD LOW TEMPERATURE OF 56 DEGREES WAS SET AT MACON THIS MORNING. THIS BREAKS THE OLD RECORD OF 65 SET IN 1967. 67 SET ON THIS DATE IN 1929...1970 AND 1971. TEMPERATURE OF 71 SET ON THIS DATE BACK IN 1947 AND 2004. THIS TIES THE OLD RECORD OF 68 SET IN 1979. MORNING. THIS BREAKS THE OLD RECORD OF 59 SET IN 1947. FOR THE 21ST DAY OF JULY...SET BACK IN 1971 AND 1947. THE 21ST DAY OF JULY WAS 59 DEGREES SET BACK IN 1971. THIS TIES THE OLD RECORD OF 64 SET IN 1923. THIS BREAKS THE OLD RECORD OF 65 SET IN 1962. 1910. CLIMATOLOGICAL RECORDS AT CHARLOTTE DATE BACK TO 1879. A RECORD LOW TEMPERATURE OF 70 DEGREES WAS SET AT APALACHICOLA TODAY. THIS TIES THE OLD RECORD OF 70 SET IN 1967. BEACH SC TODAY [July 19]. THIS BREAKS THE OLD RECORD OF 68 SET IN 2003. YESTERDAY. THIS TIES THE OLD RECORD OF 50 SET IN 1984. As the map at the top shows, a few areas in the region have had less than 5% of the normal monthly precipitation to date. 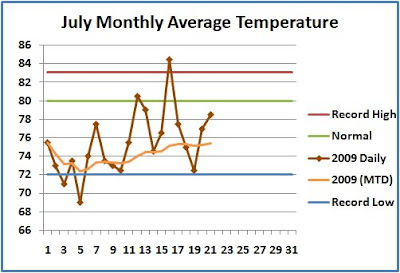 The National Weather Service has reported that the second week of July was the warmest on record in Phoenix, Arizona. The average temperature of 100.2° was well above the previous record of 99.6° in 2003. The average of 97.8° for July 1-14 was the 5th warmest start to the month. MORNING. THIS BREAKS THE PREVIOUS RECORD OF 59 SET IN 1962. THIS MORNING. THIS BREAKS THE OLD RECORD OF 55 SET IN 1976. LOW MAXIMUM FOR THE DATE. THE PREVIOUS RECORD WAS 72...SET IN 1976. 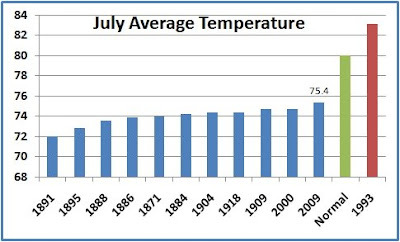 THE RECORD HIGH FOR JULY 17, LAST SET IN 2006. HIGH FOR JULY 16, LAST SET IN 1971. RECORD HIGH FOR THE DATE. THE PREVIOUS MARK WAS 116 SET IN 2005. RECORD HIGH MINIMUM TEMPERATURE OF 93 DEGREES SET IN 1998. FOR THE MOUNTAINS OF SOUTHWEST CALIFORNIA. VALLEYS...MOUNTAINS...AND DESERTS THROUGH MUCH OF NEXT WEEK.